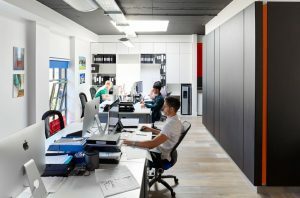 Do you fancy desksharing in our friendly open plan office in Clapham? We are a friendly but hard working group of 16 Architects and interior designers in an open plan office, that we designed ourselves. Based in the Macaulay Road development, located just off The Pavement in Old Town, Clapham, South London, and close to Clapham Common tube on the Northern line. We have 3-4 desks available on a short-term flexible working arrangement. Please contact James Munro on James@granit.co.uk for more details.